Once again, it's Then Sings My Soul Saturday. I link to Amy on her blog at Signs, Miracles and Wonders where you will find other participating bloggers. 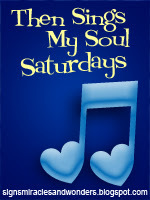 I enjoy blog hopping to listen to the songs that have touched others this week. I chose to post a video of a song that I've known for many years. In the midst of challenging circumstances, it helps me to remember where I need to focus my eyes. "Turn Your Eyes Upon Jesus" is a song that helps to remind me of His glory and grace. The things of this life are temporary. Hi, I'm a first-timer at TSMSS and visiting participants's entries. I haven't heard this song in a loooong time. Thanks for sharing. Happy Saturday. I love this old hymn. I wish folks would sing more than just the chorus, though. The verses are so rich. I love this song.. and thank you for this precious reminder this am! Wonderful choice and thank you for the reminder that things are temporary here. I love this sonh with His verses! I'm not online on the weekends for the summer so I just had the chance to enjoy this. Thank you dear sister.